Please take a moment to complete this form with as many details as possible, so we can provide you with a quick & accurate indoor channel letter quote! Combination channel letters emit light from the front and back of the letters and create the most unique signs! 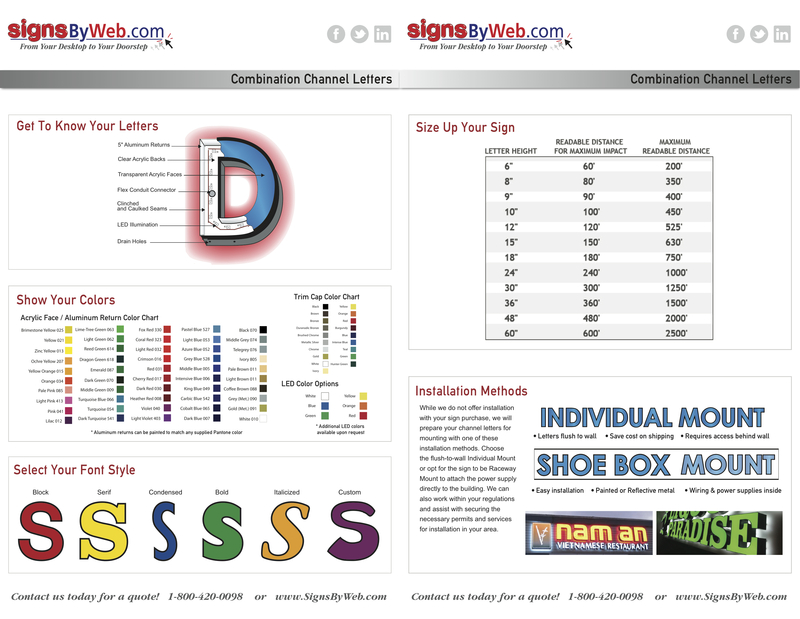 Download our Need To Know Guide for Combination Channel Letters to take our info with you! Looking for more… explore Light Capsules to add flair to your lighted sign. In the end, you get the best rate! Sign permits and installation should be considered before placing your order with Signs By Web. While we do not provide permitting or installation services, we can assist with locating an installer in your area and prepare detailed sign drawings for your landlord or permit approval. Many factors are considered when quoting channel letters, but it is primarily the height of the letters and the number of letters. If you have a specific budget in mind, let one of our trained customer service representatives work with you to plan, prepare and purchase and answer any questions along the way!